Description: The good old FS2002/FS2004 Alphasim Jaguar will always be special to me, it was one of the 1st payware addons I bought. Although the model shows it's age and is quite basic for today's standards I think it still looks nice and is good fun if you just want to hop in and fly. I hope this will be a fitting tribute to the glory days of FS2004 when developers like Alphasim created such a rich variety of military aircraft types, many of those have never been (re)done for FSX. With special thanks to Phil from Virtavia for endorsing my effort. - FSX native models (compiled with the FSX Acceleration SDK). - Configuration manager (requires XMLTools to fully function - see README.txt). - Brake chute adds additional drag (linked to thrust reverser key [F2]). Yes good work here, only I find she does not steer well in the taxi, now could this be because I have yet to add the stated load out XML yet? 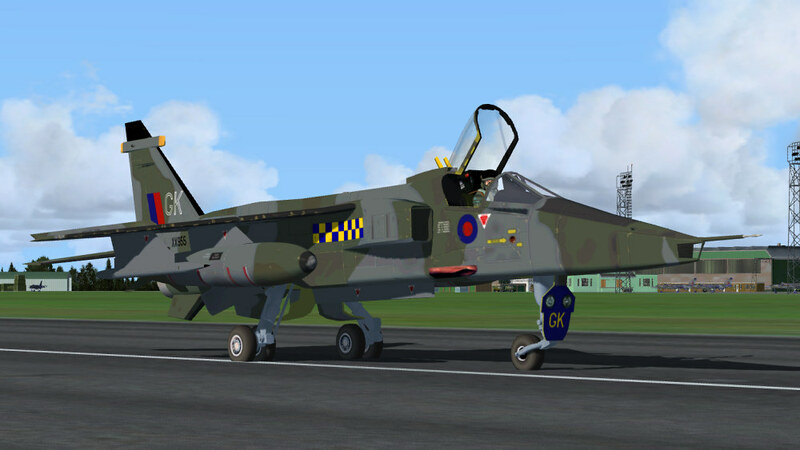 I am still in an FSX rebuilding mode but had to try the Jag. Naismith, what do you mean with she does not steer well in the taxi? Does the jet tilt too much or is the turn radius too big? I just checked and I did not see a problem (ground speed between 15 - 20 kts, gross weight ~ 31,000 lbs). XMLTools only controls the fuel load and payload weights, you can use the jet without it but then you have to adjust the fuel qty and payload weights manually in FSX Payload. This may certainly enjoy a Tacpack update. Do you want me to have a try? Corrado5834, I am not interested in TP myself but feel free to do your thing with the big cat. Working bombs, rockets and sidewinders. Gun flashes work also for non-TP users. Any misfunctioning give me a shout. I take it back, maybe I landed a bit hard or something but this morning after a fresh boot and re-fly it seems OK. Sorry if you took it as a criticism it wasn't meant as such and this is a fine update of an oldish model. Well done. Next I will have to get the XML installed. Naismith, glad to see the ground handling works ok for you now. Don't worry, I did not take your feedback as criticism. If people think there is a bug I want to know it so I can fix it.